Jason was busy tanning, Kahlua on the Rocks in hand, and Tawn was napping after his yoga, so Stuart, Piyawat and I decided to go for a stroll on the beach. The condo we rented is on Mai Khao Beach. 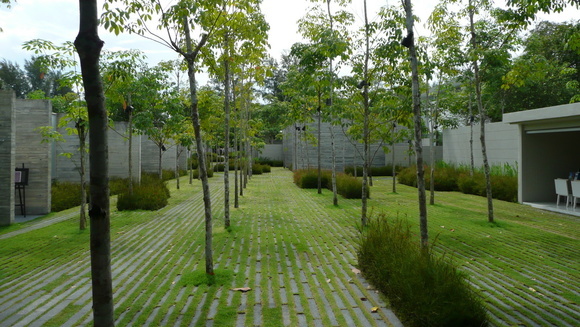 “Mai Khao” means “white trees”, a reference to the strands of birch trees located in this area. North of the airport by less than a kilometer in a straight line, this section of the island has little development in comparison to the busier cities on the south and west sides. Our guard dogs, Sing and Yuri, ran under the fence to join us. I was initially concerned that they would run away and get lost but they were very well behaved, never straying too far and always racing back when we called. It took about ten minutes to walk the kilometer or so south towards the airport. The runway ends just next to the beach and you can get quite a view of departing airplanes. Being an aviation enthusiast, I had to stop and watch a few THAI Airways Boeing 777s depart. 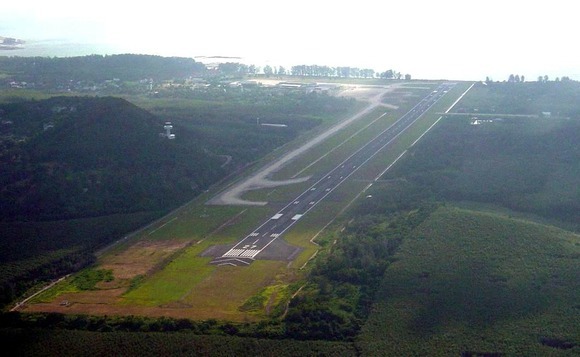 The airport is unique because it is located in an isthmus-like stretch of the north end of the island, wedged between two hills. You can see the control tower (white) on the hill to the left of the runway. The back entrance to the airport is by the narrow road that runs to the left of the taxiway. I can’t exaggerate how close this road is to the taxiway. When the jumbo jets taxi by, you feel like you need to duck lest their wingtips slice off the roof of your car. 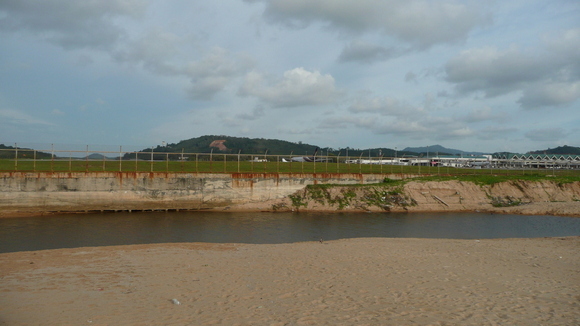 The terminal and ramp area are parallel to the beach at the far end of the picture. Also at the end of the runway is a small creek which runs into the sea. 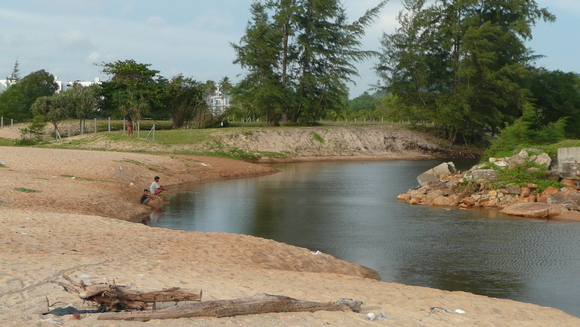 It is fed by runoff from the airport grounds. Here we have a father and son fishing for dinner in this creek. I can only imagine what sort of petroleum residue there is in that water. We encountered another fisherman on the way back. 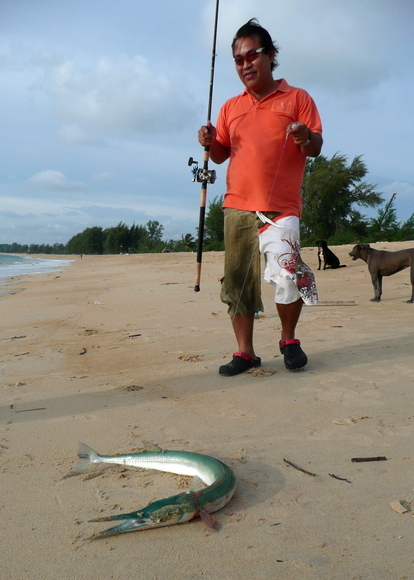 This man was fishing in the sea and landed an interesting fish as we walked up. It was long with a needlelike nose and small teeth. The color was translucent green on top and he was wriggling around like crazy. Sunday afternoon there was no rush to leave as our flight wasn’t until after 7 pm. We all piled into the car and drove ten minutes up the road to the Sala Resort, one of the high-end resorts located on the north end of the island. I think I’ve figured out the best was to enjoy resorts: just go visit them and have a drink. You get all the attentive service and ambience without having to pay the exorbitant nightly rates. 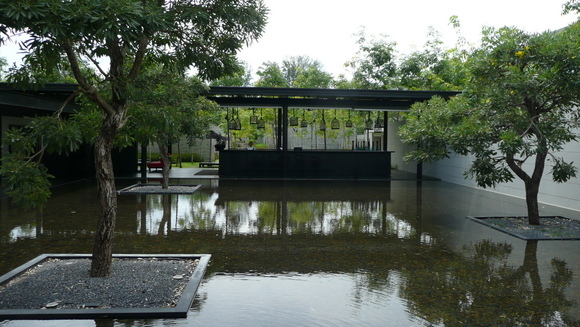 The design of the resort is, I understand, by the same person who designed Alila Cha-Am. 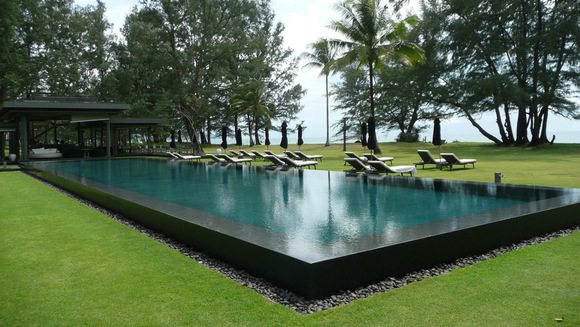 (See this entry from September 2008 about our stay at that beautiful resort on the Gulf of Thailand.) 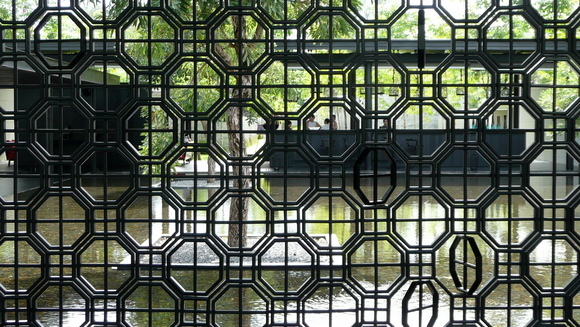 This means that it is largely modern in design, although Sala has more contemporary touches such as this vaguely Chinoiserie style screen at the entrance. Notice that some of the octagons rotate. Neat touch. Guest registration, which looks more like an open-air bar. The path from registration towards the beach. Notice the “white trees” – birches. All the guest rooms are individual pavilions (that’s where the name “sala” comes from, “pavilion” in Thai) hidden behind walls and gates on both sides of this path. 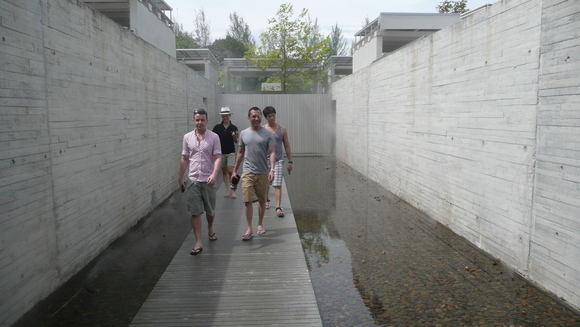 Heading through a wall of mist on our way to the spa to check our their offerings and prices. 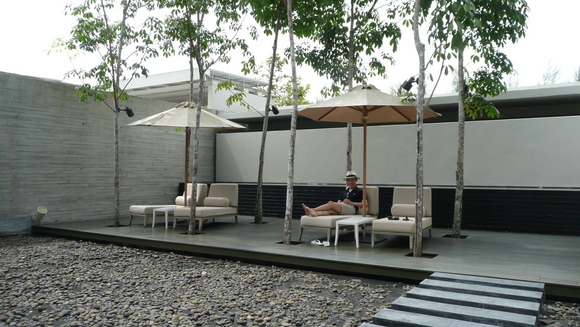 Tawn chilling out in the lounge outside the spa. There’s just a little bit of water circulating amongst the stones and another quiet waterfall trickling down the black wall in the back. The pool area near the beach. Surrounded on two sides by outdoor dining patios, we positioned ourselves on the large white sofa at the far end of the pool for some drinks and snacks. I didn’t realize it at first, but there is actually a seating area on top of the roof with reflecting pools, benches and tables. Here’s the view of the pools taken from the top of the roof, directly above the white sofa at the far end of the previous picture. The wide lawn was very different from most beach resorts and with the pine trees, it reminded me more of a mountain retreat rather than a beach side resort. 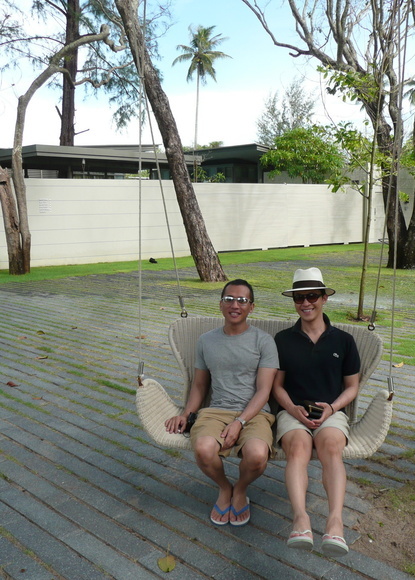 Kobfa and Tawn in one of the many love seat swings on the property. Okay, that’s it for Phuket for this trip. Hope you enjoyed! This entry was posted in Uncategorized and tagged Beach, Mai Khao Beach, Phuket, Thailand by christao408. Bookmark the permalink. I love the architecture! It looks like something out of a dream.And everything is soo green. I must have been an amazing place to see in real life. Very cool. I didn’t know you were an aviation enthusiast! I am as well. I didn’t realize the runway was so close by to the road… there’s a place, I can’t remember where, but the end of the runway is so close to the beach that it’s literally just feet away from it.We just got the F-22’s in here, so I’ve been watching them. I’m actually at the airport every day. What a beautifully designed space! I love the first snap… it’s such a typical cover shot for a spa/travel magazine. Very nice … it looks like you were in the off season as the resort looks very peaceful rather than overrun with tourists! Wow, that top picture should be on a tourism poster. Gorgeous! What serenity!! love the pictures and was so happy to see the waves rolling in Chris. Thanks for posting that. Great first picture I also love the pool one! 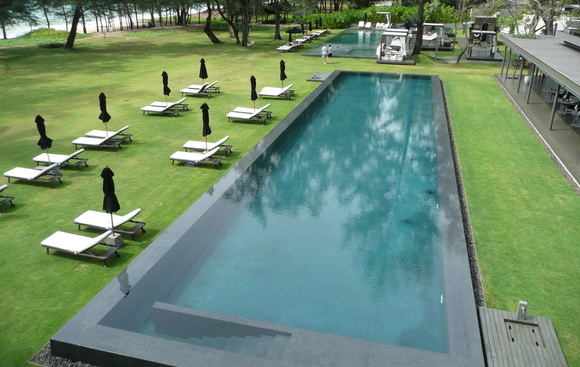 Nice photos, especially the first one and that Sala Resort! I did not realize the layout of the airport until you did such a detailed description. Gosh, I’d been flying in & out of Phuket for quite a few times, the only thing I’m aware of is which part of Phuket the airport is located! Clueless me! What a beautiful fish and resort! @WilldrawsRainbows – It was pretty nice, although I didn’t really care for the salas/rooms themselves. Kind of too modern for me. @Jillycarmel – I’m glad I had a chance to visit it, then. It is very nice and secluded. @brooklyn2028 – Yes. And they make quite a nice mango and honey smoothie. @CurryPuffy – Only an aviation geek like me would pay attention to such things…@Wangium – I really wanted to swim in the pool but didn’t bring my trunks. @ZSA_MD – You’re welcome. I suspected you would like that. @Dezinerdreams – @TheCheshireGrins – That’s a photo that I saw coming together as soon as he lay down. Beautiful composition. @TheLatinObserver – Actually, October is technically the start of the high season here. Probably a few weeks before things really start picking up but tourism is still down about 20% because of the political problems last year and the world economy. Gorgeous photos. The resort looks so empty though! @Wangium – Well, I thought about it, but didn’t want to scare anyone. =P@Rm2046 – Yes, it wasn’t very crowded.